Provides temporary or permanent metering of electrical power at 30 ampere RV sites. Can also be used for checking accuracy of existing older meters. 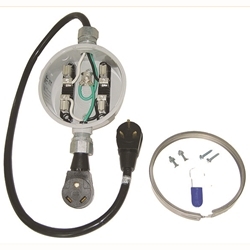 Kit comes prewired with 30 amp male cord to meter socket and 30 amp female receptacle pig tail. Includes meter ring, sea, mounting hardware and instructions. Be sure to wire meter for 120 volt as noted in the installation instructions!